There are a few times throughout the year when spring rolls touch my heart. This is one of those times. The smell in the air from flowers and plants blooming, and the cool breeze to name a couple. This past weekend was one of those weekends where the weather was simply amazing; warm and breezy one day, cool the other. These feelings sparked something that I love to make and enjoy eating. Spring Rolls. Sit back and enjoy this recipe and the appetizer. They are fresh and really easy to make. 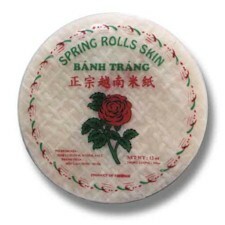 I make nearly 12 spring rolls and here is what I used. If you have reviewed the ingredients you can determine a few things; they are healthy, tasty, and easy to chop/dice/slice. Trust me, the only time intensive piece here is soaking the wrapper in warm water to allow softening for the wrapping. Get your noodles cooking and boil as the box says. Drain and let cool. Cool is the message here on the noodles as you do not want to put warm or hot noodles in the wrapper. As the noodles are cooking this is a great time to prepare your ingredients by chopping/slicing your ingredients. Because of the transparent wrapper, you can determine how you want to layout your ingredients. Do you want to guests to see shrimp on the outer layer, lettuce, carrot? You can be as creative as you want here. Keep slicing. Cooled noodles, and veggies and shrimp ready to go? Good. Get ready to wrap. When visiting an Asian market, you can find several types of wrappers. I use this type of wrapper. They are cheap, plentiful, and reliable. O.K. Wrapper is soft. Get it on a plate and lay it flat. Arrange Noodles, green onion, carrot, and cilantro in the mid to lower section of the wrapper. Fold the bottom area of the wrapper of the ingredients and begin to roll. Tuck in the sides, and continue to roll. The wrapper will seal itself. Continue this process. Do not worry if you tear a few. This is the learning process as to how long you need to soak the water, as well as how much you can stuff these things. I serve them with a sweet chili sauce. Enjoy.